This is the third post in the Cherry series. Freezing cherries. 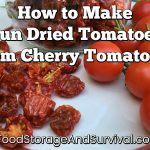 This one won’t take too long, it’s pretty easy, but I’m trying to drag out a little information over the week, so freezing cherries got its own post. When you have lots of cherries and not a lot of time, some things just have to wait. When we got all these cherries, I wanted to make fruit leather and dry some more cherries, but just didn’t have the time to do it. Freezing the cherries made it so I can do something with them later. The frozen cherries will also be good for putting in ice cream, fruit smoothies, or any other recipe calling for fresh cherries. First, wash your cherries. Seriously, if you’ve been following these cherry posts, these first couple of steps are going to look familiar. Run the washed cherries through your cherry stoner. Mine is Back to Basics brand. You could probably skip this step, but I want my frozen cherries ready to use when they thaw out. Next, put them in freezer bags and freeze them. I used my FoodSaver, and measured 2 cups of cherries into each pack so I know how much I have to thaw if I’m planning on using them in a recipe. Lastly, label your packages and put them in the freezer. Yep, that’s all there is to it. That was easy. Freezing cherries.